bay, 2004, Benchmark-Perfectly Pretty, by Bertrando. Fee: $3,000, live foal. Property of a Partnership. IDIOT PROOF is a Grade One winner of $1,294,484 who was an Eclipse Award Finalist and set 1:07.47 and 1:07.57 NTR’s, a 113 Beyer Rating at 3. RICHARD’S BOY (2012 g, by Cee’s Tizzy) In US, 9 wins, 2 to 5, placed at 6, 2018, $933,055, Jim McKay Turf Sprint S., Governor’s Cup S., California Cup Sprint, Desert Code S. ($60,600, SA) $92,500, Jess Jackson Owners’ H. ($42,150, SR) $62,975, 2nd Breeders’ Cup Turf Sprint G1T, Eddie D S. G3, Green Flash H., Sensational Star S., California Flag H., Sensational Star S. twice, 2nd Harris Farm S.-R ($19,000, FNO) $100,105, 3rd San Simeon S. G3, Echo Eddie S.-R ($22,000, SA), Gulfstream Park Turf Sprint S., Joe Hernandez S.
Frisco Fog (2011 f, by Summing) In US, 5 wins, 2 to 4, $165,034, 3rd Oak Tree Distaff S.-R ($12,000, OTP) $100,000. Ninety Nine Proof, 5 wins, 2 to 4, 2018, $151,642, 3rd Silky Sullivan. 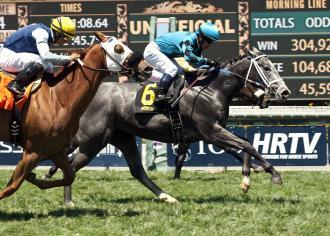 Faith Proof (2011 f, by Spend a Buck) In US, 6 wins at 3 and 4, $89,420, Ntr Los Alamitos Race Course 5f 00:56.42 2014. GRANTVILLE, Pa. – Richard’s Boy became the third California-based horse to win a stakes at Penn National on Saturday – but it wasn’t easy. As a matter of fact, things were difficult for several horses in the $200,000 Governor’s Cup as there were a pair of jockey objections regarding separate incidents. Bold Thunder, at 24-1, outsprinted 3-5 favorite Richard’s Boy for the early lead in the five-furlong turf sprint. Bold Thunder, with Irad Ortiz Jr., was digging in during the stretch run when Ortiz switched from a right-handed stick to a left and hit the 7-year-old. Bold Thunder immediately ducked outward. Ortiz quickly grabbed a hold but the damage had been done as Bold Thunder herded Richard’s Boy outward several paths. Jockey Paco Lopez, who was beaten a head on Richard’s Boy, lodged an objection and the stewards reversed the order of finish. “He carried my horse out, and then my horse was coming on again,” Lopez said. Ortiz said he did all he could when Bold Thunder ducked out. “He surprised me when he did that,” Ortiz said. Richard’s Boy paid $3.20. Bold Thunder covered the course in 55.75 seconds. The second claim of foul was lodged by Horacio Karamanos, the rider of Oak Bluffs, who finished fourth, against Javier Castellano, the rider of Rainbow Heir, who finished third. Both horses were near the back of the pack nearing the far turn. Rainbow Heir moved up outside Oak Bluffs, and Karamanos took up sharply up entering the turn. Karamanos thought Castellano put him in tight quarters entering the bend. Castellano maintained that he kept to his path and did not come inward. The stewards disallowed the objection. Rainbow Heir rallied up the inside to finish a neck behind Richard’s Boy. It was a half-length back to Oak Bluffs, who rallied outside horses. BALTIMORE, Md. (May 19, 2017) –The horse who ended the dominance of Ben’s Cat in the $100,000 Jim McKay Turf Sprint Stakes at Pimlico Race Course May 19 was taking a pretty significant step down in class. Richard’s Boy—Rockingham Ranch’s West Coast-based gelding, bred by Harold Tillema & Pamela Tillema—encouraged his connections to send him overseas to take on some of the best turf sprinters in the world March 25 in the Al Quoz Sprint Sponsored By Azizi Developments (G1) in Dubai, and he gave a good account of himself. The gray 5-year-old son of Idiot Proof finished fifth, 2 1/2 lengths behind winner The Right Man, in the $1 million race, but the six furlongs really wasn’t his specialty. Even his game efforts in recent months in races down the Santa Anita Park hillside turf course—where he’s placed in four straight stakes—just really aren’t his best distance. The five grassy furlongs of the Jim McKay, however, are just up his alley. He came into the Jim McKay with three wins from four starts at the distance on turf, with his only loss a second in another stakes at Del Mar. The globetrotting for Richard’s Boy also might not be over. “We’re thinking of using this race as a prep for Royal Ascot,” Miller said. ARCADIA, Calif. (Jan. 28, 2017) — Nearly two years after he was acquired privately, Richard’s Boy is still providing massive rewards for Gary Hartunian’s Rockingham Ranch. 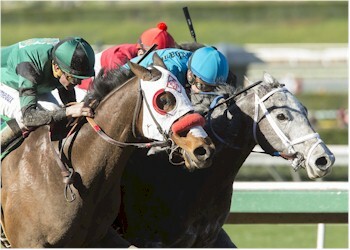 In Saturday’s $150,345 California Cup Sprint at Santa Anita, Richard’s Boy held off a stubborn Well Measured to win the six-furlong race for California-breds by a nose. The winner’s share was worth $90,000. Richard’s Boy won his third stakes in the Cal Cup Sprint, and first on dirt. He won sprint stakes on turf here and at Santa Rosa in 2015. Ridden by Flavien Prat, Richard’s Boy earned Saturday’s victory. He was challenged early by Jimmy Bouncer and Acceptance, racing within a neck of the lead through early fractions of 21.89 seconds for the opening quarter-mile and 44.38 for a half-mile. Acceptance led narrowly with a quarter-mile remaining, but Richard’s Boy led by a half-length over Acceptance at the eighth pole and held off Well Measured at the finish. Richard’s Boy ($6) ran six furlongs in 1:08.71. “He’s an old, classy horse,” Prat said. “On the backstretch, he was pretty aggressive. Past the three-eighths pole, he relaxed well. He knows the job,” Prat said. Well Measured, claimed for $20,000 in his last start, finished a half-length in front of Acceptance, who was followed by Jimmy Bouncer, Solid Wager and Tough But Nice. Richard’s Boy was a slight favorite over stablemate Solid Wager, who was also 2-1. Solid Wager finished in a dead heat for first in the Grade 3 Midnight Lute Stakes on Dec. 31. Solid Wager was beaten 2 3/4 lengths by Richard’s Boy. Richard’s Boy and Solid Wager are trained by Peter Miller. A 5-year-old gelding by Idiot Proof, Richard’s Boy has won 8 of 19 starts and has earned $536,080. Seventh in the 2016 Cal Cup Sprint, Richard’s Boy has been in the first three in his last seven starts, a span that includes four second-place finishes and a third in stakes races, all on turf. DEL MAR, Calif. (Apr. 1, 2016) — The unraced colt Snow Proof has proven to be popular at sales in California in the last year. Last August, Snow Proof was the most expensive hip at the Northern California Yearling Sale, selling for $72,000 to John Brocklebank, agent for Dickman Legacy Ranch. Wednesday, Snow Proof was purchased for $150,000 by Hall of Fame trainer Bob Baffert at the Barretts March select sale of 2-year-olds in-training at Del Mar. Snow Proof was the most expensive hip among the 16 California-breds listed in the catalog of the one-day sale. Of those, eight were withdrawn and five sold for an average of $89,000. Three were listed as bought back. The overall sale averaged $124,558. The leading hip at the sale was a colt by The Factor who was purchased for $460,000 and is bound for Japan. Baffert signed the sale ticket, as agent, for Snow Proof, indicating the colt will race for one of his clients. Snow Proof is by Idiot Proof and is out of the Smart Strike mare Reine des Neiges. Timothy O’Leary bred Snow Proof. The colt has a fascinating female family. The second dam is Miss Snowflake, the dam of Snow Chief, the champion 3-year-old male of 1986. Snow Proof was one of two Cal-breds to sell for six figures, including a filly by Adios Charlie purchased for $125,000 by Justin Casse of Ocala, Fla., as agent. SANTA ROSA, Calif. (Aug. 15, 2015) – Favored California-bred Richard’s Boy rallied three wide then held on gamely to win Saturday’s $62,975 Jess Jackson Owners Handicap at Santa Rosa. Richard’s Boy is by Idiot Proof, out of the Cee’s Tizzy mare Marissa’s Joy, was bred by Harold and Pamela Tillema, is owned by Rockingham Ranch and trained by Peter Miller. He has five wins in eight starts, earnings of $242,240 and was coming off a fourth in the Aug. 2 Real Good Deal Stakes. He ran the five furlongs in :56.51 and won by a neck. ARCADIA, Calif. (May 2, 2015)– Richard’s Boy rebounded from the first loss of his career last month to win Saturday’s $92,500 Desert Code Stakes for 3-year-olds on the hillside turf course at Santa Anita. Ridden by Fernando Perez, Richard’s Boy ($5.60) closed from fourth in a field of seven to win by a neck over Diamond Majesty. The victory gave owner Rockingham Ranch a sizeable return on the investment of a private purchase of the gelding in March. In his first start for Rockingham and trainer Peter Miller, Richard’s Boy was a well-beaten third in the Echo Eddie Stakes for California-bred 3-year-old sprinters on dirt April 4, leading to the stretch before fading. In the Desert Code Stakes, Richard’s Boy stalked the pace of Guy Code through an opening quarter-mile of 22.68 seconds, and the half-mile fraction of 45.75 seconds set by Diamond Majesty, before moving into contention when the field reached the main turf course. Diamond Majesty led by two lengths with a furlong remaining but could not hold off Richard’s Boy. Diamond Majesty, a 9-1 chance, finished a head in front of 6-1 Perfectly Majestic in third. Bench Warrant was fourth, followed by Win the Space, Guy Code, and Desert Dynamo. Richard’s Boy won his first three starts for owners and breeders Harold and Pamela Tillema and trainer Herb Bacorn before being acquired privately by Rockingham Ranch and turned over to Miller. Richard’s Boy’s win was the start of a remarkable half-hour for Miller. Minutes after the Desert Code Stakes, the stable’s Finnegans Wake won the $500,000 Woodford Reserve Turf Classic at Churchill Downs. The Woodford Reserve was the second-richest win of Miller’s career behind Comma to the Top’s victory in the 2010 CashCall Futurity at Hollywood Park. Richard’s Boy, by Idiot Proof, has won 4 of 5 starts and earned $187,840. RICHARD’S BOY (2012 g, by Cee’s Tizzy) In US, 5 wins at 2 and 3, 2015, $242,240 (US SSI = 6.46): 8. 1st Desert Code S. ($60,600, SA) $92,500, 1st Jess Jackson Owners’ H. ($42,150, SR) $62,975, 3rd Echo Eddie S.-R ($22,000, SA) $200,250. Frisco Fog (2011 f, by Summing) In US, 5 wins, 2 to 4, 2015, $154,394 (US SSI = 2.25): 18. 3rd Oak Tree Distaff S.-R ($12,000, OTP) $100,000. Faith Proof (2011 f, by Spend a Buck) In US, 6 wins at 3 and 4, 2015, $89,420 (US SSI = 3.00): 8. Ntr Los Alamitos Race Course 5f 00:56.42 2014. Jenna’s Faith (2012 f, by Half Term) In US, 2 wins at 3, 2015, $76,924 (US SSI = 4.75): 4. Ruff Proof (2011 f, by The Wicked North) In US, 2 wins at 3, $63,560 (US SSI = 2.62): 6. Maddie Moo (2011 f, by Silver Deputy) In US, 4 wins at 2 and 3, $60,057 (US SSI = 2.00): 7. Good Proof (2011 f, by Fact Book) In US, 4 wins at 2 and 3, $29,652 (US SSI = 0.56): 12. Alizarin Beauty (2013 f, by Quiet American) In US, Winner at 2, 2015, $22,600 (US SSI = 2.33*): 2. Where Is My Mind (2012 f, by Memo (CHI)) In US, Winner at 2, placed at 3, 2015, $21,820 (US SSI = 0.50): 9. Kat Proof (2012 g, by Ministers Wild Cat) In US, 2 wins at 3, 2015, $13,102 (US SSI = 0.35): 8. Sire Line: The best sons of Alydar; Alysheba, Criminal Type and Turkoman were all sold off from Kentucky – to the UAE, Japan and Turkoman of course ended up in California. This tells us that Alydar, who himself bred like he was bred (inbred to classic-oriented Calumet stalwarts Bull Lea and *Blenheim II who failed to establish long-term sire successors), was probably going to get better daughters than sons – current sires Cat Thief and Gio Ponti are out of Alydar daughters. Turkoman carried on this trend and today his name is valued to a degree as the broodmare sire of Point Given and Hard Spun. Benchmark comes from the ‘large heart’ family of Pocahontas (3-N). His family carries him – the dam was graded stakes placed at Saratoga and has produced a good family line that includes Tranquility Lake and her good runners Courageous Cat and After Market. Note that many of Benchmark’s top runners were out of daughter of Bertrando and Pirate’s Bounty, both of which were Wygod-owned. Idiot Proof follows this pattern and also shows several inbreeding crosses that Benchmark liked – Boldnesian, In Reality, and The Axe II. Idiot Proof tails to the main branch of Family 12, with a daughter of Lexington, Salina, his 13th dam, who also produced the great Salvator (1886). This immediate (modern) family has also produced the stakes placed Slew City Slew filly All Slew, 3rd in the listed Natalma Stakes at Woodbine in Canada and her Sky Classic daughter Sky Dreams. Sky Dreams won the Alameda County Fillies and Mares Handicap at Pleasanton and placed in the G3 Yerba Buena Handicap at Golden Gate Fields. There is also a minor stakes placed colt by Silver Deputy named Oak Hill who ran 3rd in the Black Gold Stakes at Fair Grounds in Louisiana. He’s bred on the same cross (i.e. out of a Bertrando mare) as several other Benchmark kin like Silent Sighs, Proposed and Smooth Performer. Again, this is the result of the Wygod’s owning both sires. His major family inbreeding is to Nearctic/Indian Hemp which are very closely related sharing a Nearco/Hyperion/Sister Sarah nexus. He is also linebred to *La Troienne, which has become quite common. One of his more unique crosses is a double of The Axe II, once thought to be a source of unsoundness and now generally regarded as a source of stamina. Alydar/The Axe II (via Hatchet Man) also combined to give us Strike the Gold who won the Kentucky Derby and became a successful sire in Turkey. One might as well drill where oil’s been found and what he lacks that his sire has done well with are two lines, Pirate’s Bounty/Tom Rolfe and Seattle Slew (liking both the Boldnesian and Round Table lines, the latter also being found in Point of Reference, Alywyn and The Yellow Sheet). I know it’s hard to avoid but I think it is more important than ever with a Raise a Native/Danzig cross to avoid doubling Raise a Native. Other possibilities are Royal Academy – to cross over his Storm Cat line and also Pancho Villa, a full brother to Terlingua, dam of Storm Cat. So all horses from this family which tails to Crimson Saint are strong choices. Tiznow pops up once again. He tails to Crimson Satan’s family and provides an extra Relaunch cross – I think could be very potent. Deputy Minister has a cross of Bellesoeur which is also found in Bertrando via Beau Gar. Benchmark did well with Deputy Minister mares – Bench Points, Stella Mark, and Alywyn all carry this cross. It should work even better with Idiot Proof. If you were lucky enough to get your hands on an Alphabet Soup mare, he carries a Battlefield cross – this is Dark Display, the tail of Storm Bird in Storm Cat. We have begun to see inbreeding to Danzig. I think it’s an awful idea because of his knees. So if this presents itself, try to stick to Danehill who created his own type and watch the knees whatever you do. An alternative might be Chief’s Crown who is from the same tail line as Alydar’s broodmare sire, On-And-On (Two Bob). Concerto also adds TV Lark and In Reality. Mares carrying Caveat would be good for two reasons – doubling Cold Hearted, Benchmark’s 2nd dam and also adding another Almahmoud line to Northern Dancer in Storm Cat. I doubt there is much if any Slewvescent blood left, as the Walters never bred a lot of mares to him, but he was out of Our Mims, Alydar’s half sister and you have that Seattle Slew connection as well. Gentlemen (ARG) I believe was in CA for awhile and he tailed to Danzig’s family, so there’s another thought. He was gorgeous but a disappointing sire but that doesn’t mean that a mare with a cross of him is hopeless if the rest of the pedigree fits. 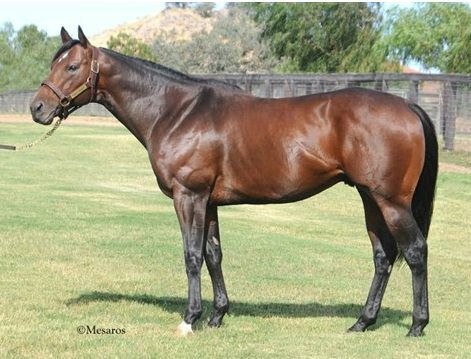 Houston who stood in CA is from Smarten’s family (Smarten being the sire of Idiot Proof’s 2nd dam). Again, this adds Slew and you reinforce a tough old Fred Hooper family, another good member of which is Quadratic, though he’s harder to find. Beadah (Foggy Note in Relaunch) is a wonderful family but try to avoid Tapit. They run all right, but he’s already inbred to Raise a Native and a third cross could spell big trouble. Instead, see if you can find some other of the lines like Chimes Band or Freeforinternet – or the aforementioned Rubiano.